Narragansett is a picture-perfect town on the Rhode Island shore that is very popular in the summer months. Famous for "The Towers"—the architectural landmark that is all that remains of the once glorious Narragansett Pier Casino designed by McKim, Mead & White—Narragansett makes an ideal home base from which to explore not only these local attractions but the entire Ocean State. The Narragansett Town Beach is a gem, with soft sand, views of The Towers, and vigorous waves perfect for surfing or boogie boarding. Restaurants are within walking distance, and the daily non-resident fee is a small price to pay for access to a beach that evokes all of the Rhode Island shore's beauty and history. It's far from your only option, though. Scarborough State Beach in Narragansett is one of the state's most popular destinations, and Roger Wheeler State Beach and Salty Brine State Beach both offer a quieter vibe and calmer surf, so they're well-suited for families with young children. The grounds of Narragansett's famous lighthouse are open to the public by day. 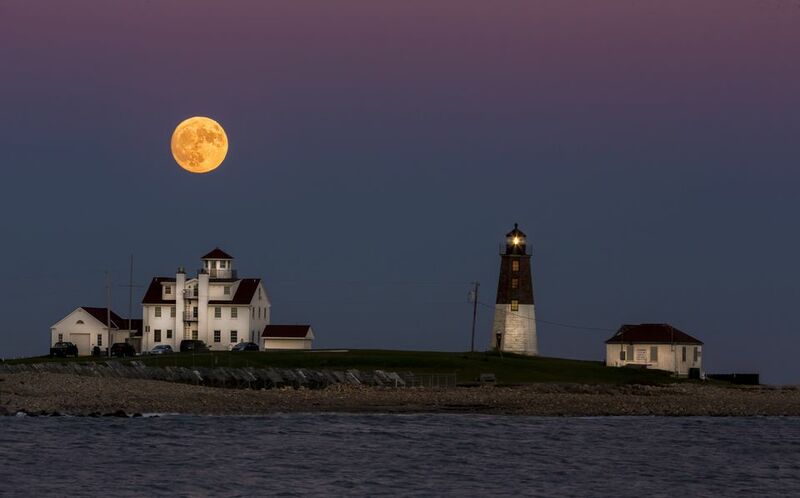 Point Judith Light (1470 Ocean Road, Narragansett) is still an active Coast Guard station, and you'll be chased away as the sun sinks, so arrive about an hour before sunset to see the beacon as the sky begins to color. The lighting at this time of day makes the cairns below the light appear even more magical. The highlight of your stay in Narragansett may turn out to be a surfing lesson at Narragansett Town Beach with Peter Pan Surfing and SUP Academy. Peter Pan offers both one-on-one and group lessons for beginners and more experienced surfers, plus all of the gear you'll need to give surfing a go. After a short introduction on the beach, your instructor will take you out into the water to attempt to catch your first wave. Chasing your own clams may seem like the antithesis of being on vacation, but if you sit at a desk all day, you may also relish the chance to spend time digging instead of thinking. For $11, you can obtain an RI Tourist Shellfishing License that's valid for two weeks. And the clams you harvest at Point Judith Salt Pond in Galilee will be fresher and sweeter than any you've tasted. Just a 30-minute trip aboard the Block Island Hi-Speed Ferry from Point Judith, Block Island is an enchanting place to spend a day while you're vacationing in Narragansett. Known for its beaches, lighthouses, hiking trails, and fishing charters, Block Island has retained its Victorian-era charm. Traditional ferry service also connects Narragansett and this throwback isle. It's cheaper, and the voyage takes 55 minutes each way. Before you leave Narragansett, hike out to Black Point. Kids will have fun searching for crabs and other sea life in tidal pools, and the views from this spot will make you feel as if you've left Rhode Island behind. There is a small parking area at the trailhead on Ocean Road, about three miles south of Narragansett Town Beach. An easy hike of less than a mile leads to this rocky spot on the coast where you can fish or picnic. The deck at the Coast Guard House (40 Ocean Road, Narragansett) is as close as you can get to dining on the water without chartering a boat. Bring a jacket because it's often breezy near the ocean, and kick back and enjoy cocktails made with local spirits. The deck menu features raw bar selections, burgers, paninis, simply prepared seafood, and a handful of choices for kids. Try the fish tacos! Bananas Foster artisanal granola from Providence-based Beautiful Day is just one of the potential scores at the ​Coastal Growers' Market on a summer Saturday. The market is held weekly from 8:30 a.m. to 12:30 p.m. at historic Casey Farm in Saunderstown, a village just about a 12-minute drive north of the Narragansett Town Beach. Sample gourmet food items made in Rhode Island, shop for fresh produce and tuck into a large lunch. Celebrity Chef Guy Fieri helped put Crazy Burger (144 Boon Street, Narragansett) on the map, and travelers are crazy about the eclectic menu at this compact eatery, too. How often do you find vegan options at a burger joint? Or breakfast selections available until 4 p.m.? You won't go wrong with a Whassupy Burger and basil lime lemonade. Crazy Burger is BYOBBAM (Bring Your Own Booze, By All Means!) and also serves dinner, which means you'll actually be tempted to dine here three times a day. Aunt Carrie's (1240 Ocean Road, Narragansett) has been owned by the same family since 1920​ when Carrie and Ulysses Cooper decided they needed a permanent stand where they could meet the demands of campers and fishermen for her chowder and clam cakes. A fourth generation still uses Carrie's corn fritter recipe as the basis for these famous clam cakes, which you can savor indoors or out.